Backwards compatibility, a feature of Microsoft’s console which allows you to play Xbox 360 games on the Xbox One, is one that many gamers likely love already. After all, it saves you from having to lug out your old 360 to the living room in order to enjoy the golden oldies you may have lying around, meaning you can finally put that old Xbox 360 out to pasture for good. And the truth is that a boatload of top-notch games hit the Xbox 360 back in the day, and many of these games can now be played on Microsoft’s Xbox One consoles. Actually, the Xbox One backwards compatibility list already features almost 400 games, including high-calibre classics like Red Dead Redemption, Call of Duty: Black Ops and of course, the early Assassin’s Creed games. And speaking of Assassin’s Creed, Microsoft recently announced that another Assassin’s Creed has joined the list. 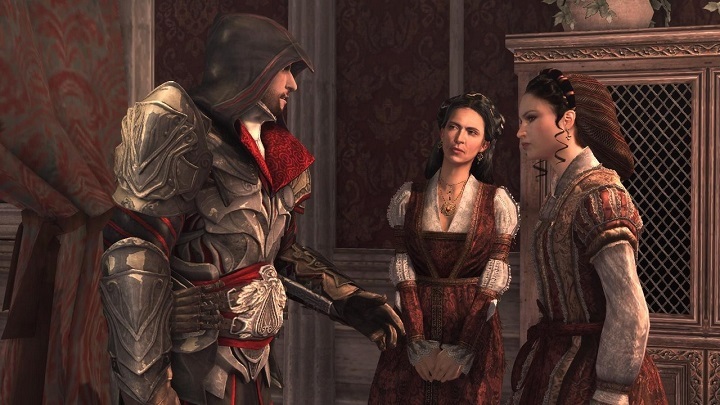 This is none other than Assassin’s Creed Brotherhood, the 2011 classic which some consider the series’ best (it’s actually behind the likes of Assassin’s Creed II, Black Flag and Revelations on our list). This was an expected addition to the backwards compatibility list, given that other Assassin’s Creed classics like the last-gen Assassin’s Creed II and Assassin’s Creed Revelations are already playable on the Xbox One. It’s also great to be able to revisit Brotherhood, though, as it does have a wonderful Renaissance Rome setting and plenty of monuments such as the Pantheon to climb (and read about on the game’s database too, something that history buffs will no doubt appreciate). Plus, the opening battle sequence is arguably the high point of the series too. Aside from Assassin’s Creed: Brotherhood, Microsoft has also revealed that four other games are now backwards compatible. These are Radiant Silvergun, Blazing Angels: Squadrons of WWII, Wolf of the Battlefield: Commando 3 and Cyber Troopers Virtual-On Oratorio Tangram. If you don’t own any of these or Brotherhood and are looking to make the purchase, note that these are all available on the Xbox Store, except Blazing Angels: Squadrons of WWII, which can be purchased on disc from the likes of Amazon. However, if you already own any of these digitally they should show up on your “Ready to Download” list, while owners of a physical edition can simply pop in the disc and start playing right away. So, the addition of these games to Microsoft’s backwards compatibility list for the Xbox One will certainly be good news for those who were looking to replay Assassin’s Creed Brotherhood, or any of the other new additions to the ever-growing backwards compatibility list. These latest additions did come after an unusually long wait, but hopefully Microsoft will have many more surprises to announce and new games to add to the backwards compatibility list before this year’s out.